President Timothy E. Trainor, Ph.D. presents Simon Bruté Medal to Captain Stephen J. Bury, USN (Ret.). Captain Stephen J. Bury, USN (Ret. 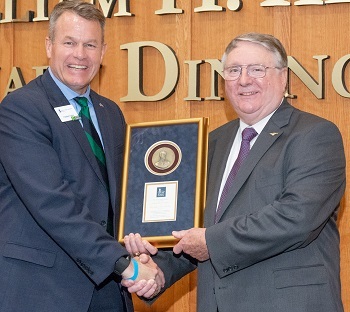 ), who has served the United States for more than 45 years in the United States Navy and in support of the United States Army, was presented by the Mount St. Mary’s University National Alumni Association with the Simon Bruté Medal on June 1. The medal is bestowed on alumni who have distinguished themselves through their career, commitment to their community and the Mount and service to their fellow citizens. An active alumnus who graduated in 1972 with a Bachelor of Science in psychology, Bury promotes the Mount and makes frequent visits to campus. In accepting his award, Bury fondly recalled one visit that “disrupted classes that day.” In support of a Navy recruiting mission, he flew a Navy SH-3 Sea King helicopter to the Mount, landing on Echo Field. Over the years, Bury has been involved with preservation of the Mount archives, integration of Wounded Warriors into campus life, development of Veteran’s Walkway, student recruitment and career development and networking. He has been an active member of the Rector’s Council since 2006. “I learned how to learn at the Mount, as well as how to live significantly and to challenge myself,” said Bury, a member of the Monsignor Tierney Honor Society. During Bury’s decorated military career, he accumulated more than 4,400 hours while flying more than 10 different models of rotary and fixed wing aircraft. His flying tours carried him across the world, conducting operations and culminating in command of a carrier-based helicopter squadron. His career additionally gave him a wide breadth and depth of acquisition program experience, as well as managing a variety of programs from bilateral/multilateral cooperative research and development programs, military equipment sales and leading international delegations. Since 2002 Bury has supported the deputy assistant secretary of the Army for research and technology/Army chief scientist as a senior analyst with Hunting Ingalls Industries - Technical Solutions Division. Currently serving as a part-time consultant, he assists in the development of Army science and technology strategic planning and analysis that manage and integrates oversight of science and technology programs across the Army. He is published in seven magazines and journals including Military Psychology and the International Journal of Intelligence and Counterintelligence. The Simon Bruté Medal, first awarded in 1965, is named in honor of the Right Rev. Simon Gabriel Bruté, who was instrumental in the Mount’s early years, coming to the then college in 1812 to teach divinity and philosophy.